Back in the beginning of the 21st century, there was a short period when people believed anime was on the verge of breaking to the mainstream audience in the west. People beyond the limited circles of anime fans started talking about anime productions, and science fiction and fantasy fandom in particular began listing certain anime shows right next to live-action modern classics (a list dominated, at the time, by Babylon 5, The X-Files and Buffy the Vampire Slayer). Shinchiro Watanabe’s Cowboy Bebop would come up frequently in this context; indeed, it is considered by many to be one of the finest examples of science fiction television, animated or otherwise. The buzz it created was so strong that the Wachowski siblings invited Watanabe to direct not one but two short films in their Animatrix anthology. What was it that made Cowboy Bebop such a fan favorite and critical darling? Geeks drooled at Watanabe’s skill in piling up one familiar genre on top of the other, while still keeping the show ‘s futuristic world wonderfully coherent and believable. Sure, space westerns were nothing new when Cowboy Bebop debuted (in fact, the idea is almost as old as both genres), but a space western crossed with neo-noir… and blaxploitation film… and the Hong-Kong action cinema… well, that was something new. Of course, Cowboy Bebop owes as much to anime classics as it does to foreign film genres. Lupin III is an acknowledged inspiration. Yet another, often overlooked source of inspiration is even more significant in my opinion: Leiji Matsumoto’s space operas, which provided Cowboy Bebop with much of its sci-fi setting. Born in 1938, Matsumoto worked as an assistant to the great Osamu Tezuka before embarking on his own career, which at first spread across a wide variety of genres – shoujo romance, comedy and historical war stories. Several of his early works also focused on science fiction, but it wasn’t until his involvement with the ambitious Uchu Senkan Yamato (Space Battleship Yamato or Star Blazers as it is known in English) that his name became synonymous with the genre, specifically with space operas. Yamato told the heroic story of the crew of a World War II battleship retooled for space travel, on a voyage to save Earth from evil aliens who had turned the planet into a nuclear wasteland. It set many standards for science fiction anime that are evident to this very day: from the telling of an epic story spread across an entire season to the insistence on making clear that death and loss always accompany war. Though Gundam is perhaps the most iconic science fiction franchise in anime today, it can be argued that Gundam wouldn’t have happened if it wasn’t for Yamato. Yet Yamato, while certainly a landmark in anime history, is less interesting compared to Matsumoto’s later adventures in space opera. 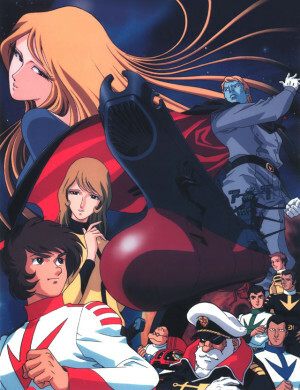 Yamato was a military power-fantasy in which Japanese soldiers went to win in space the war that they lost on Earth; there is no such victory waiting for characters that populated the later (loosely-connected) futuristic stories by Matsumoto as space pirates Harlock and Emeraldas or the passengers of the famous space train Galaxy Express 999. The World War II metaphor is every bit as present in Matsumoto’s (loosely-connected) post-Yamato space operas as it did in the franchise that brought him his initial fame in the franchise, but in the later works the metaphor is for the post-war period, the time that Japan rebuilt itself from the ashes of the defeat and the price paid by the people who got stepped on in the process. For Matsumoto, who grew up in the post-war period, these stories carry a strong autobiographical element: check out almost any animated adaptation of his futuristic universe (right up to Shinji Aramaki’s 2013 CGI extravaganza) and you’ll find the character of an angry young boy who grows up in poverty. 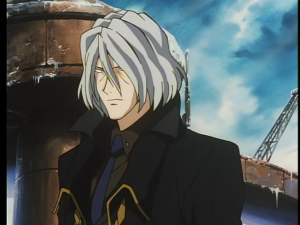 Cowboy Bebop has made few direct references to Matsumoto’s futuristic universe – the most obvious being the character of Vicious, who borrowed certain design elements from Matsumoto’s Harlock (notably the pet bird on his shoulder). 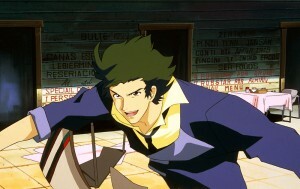 Certain visual resemblance can also be found between Bebop‘s genius hacker Ed and the genius scientist Tochiro who accompanies Harlock in his journeys, and the doomed romance between Spike and Julia echoes that of Harlock and his love Maya (Julia’s design of classic European beauty also brings to mind Matsumoto’s female characters). Matsumoto’s futuristic universe, like Cowboy Bebop, also brings together elements from many different genres, chief among them the western (in fact, Matsumoto has presented several prototypes of his famous heroes in his western-comedy Gun Frontier before he cast them as protagonists of his space-operas), and also the swashbuckling adventure films of Errol Flynn, the samurai films of Akira Kurosawa and even the gothic horror of German expressions and the UK’s Hammer Studio. This genre-mix is perhaps best exemplified in Galaxy Express 999, which (much like Bebop) was a journey between the different exotic planets of Matsumoto’s universe, each with its own unique look which references a known type of story but also (again, much like Bebop) populated by eccentric characters whose behave weirdly, even by 30th-century standards. It is here that Cowboy Bebop and Matsumoto’s space operas most resemble each other, but also where they most differ: in both cases, the futuristic universe uses bits and pieces from familiar genres to give the feeling of financial and moral bankruptcy – almost everyone lives in poverty, either in thinly-populated towns or the slums of big cities – but in Matsumoto’s works, there are heroes who can save the people, through both their actions and as an example. In Watanabe’s Cowboy Bebop, the heroes are futuristic Don Quixotes who rarely manage to save anyone, and usually leave a mess behind them. Like Matsumoto, Watanabe gives us a futuristic universe that’s in a bad shape, but nobody cares. People just want to go about their business, without being bothered by those playing heroes. The similarities and differences between Matsumoto’s space operas and Cowboy Bebop show not only the important place that Matsumoto’s work occupies in Japanese science fiction to this day, but also how much the perception of heroism has changed since he began working in the genre. Raz Greenberg recently received his PhD on animation as a text from the Hebrew University.